Walking with Jesus: Day 34: Matthew 14:1-21 & Psalm 34 - Can We Foresee the Consequences of Our Actions? Day 34: Matthew 14:1-21 & Psalm 34 - Can We Foresee the Consequences of Our Actions? Can We Foresee the Consequences of Our Actions? Poor Herod. Those may seem like odd words for a man who had John the Baptist beheaded and whose father ordered the slaughter of the babies in Bethlehem, but for some reason I always feel sorry for Herod in this situation. Maybe it's because I've made my own foolish choices and have had to face the consequences too many times. Herod was a man who has given himself to sensuality and ended up being manipulated into murdering an innocent man. We never know what consequences our actions may have, for the good or for the bad. When we give ourselves over to a certain sin - sensuality, greed, envy, covetousness, pride - it often leads us to others we may never have chosen otherwise. Solomon's desire for foreign wives led the wise builder of the Temple into idolatry. David's neglect of his duty to the army as king - his lazy self-indulgence - led to his adultery and murder. Thankfully, the same unforeseen consequences are true in the good direction, too. We don't know how our faithful actions of obedience will be used by God. In the story that immediately follows the execution of John the Baptist, the disciples were told by Jesus to feed a crowd of thousands. The problem is that they only had five loaves and two fish. How could they feed so many with so little. “Bring them here to me.” (v. 18) Jesus' words were simple and direct. The disciples obeyed and the result was powerful, amazing, literally miraculous. So, the question for us seems simple enough, though it is more difficult than we could even imagine: Will we give ourselves to our sin or will we bring whatever we have and give it to Jesus? Will we seek to run our own lives our way and serve our own desires, or will we surrender everything to Christ and let Him take our meager resources and multiply them for His glory? This is such a wonderful Psalm. Several years ago, the school where I served as Headmaster memorized this Psalm. It sings with power, truth, grace and wisdom! Heavenly Father, I do indeed bless Your name. Every day I bless You, for You are faithful and wise, holy and good. I have nothing in myself in which to boast - no wisdom, no power, no righteousness - but I will boast in You, O Lord. Your steadfast love, Your saving grace, Your patience, Your power, Your purposes, Your glory - for all of these and for so much more, You and You alone are worthy of praise and I need to praise You, to magnify Your name and not my own, to worship You, to serve You, to love You. Lord, when I have sought You, it has been clear that it has only been because You were always seeking me. You call me to Yourself and as soon as I turn to You, You answer me and deliver me from all my fears and failures, from all my troubles, sins, distresses and enemies. You are the Great Deliverer of Your people. O Lord, deliver those who are ensnared in sin or persecuted by enemies today. 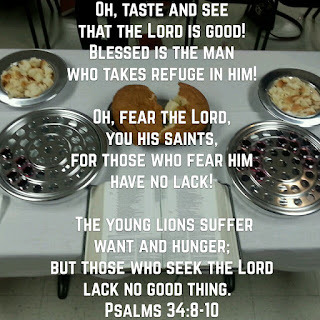 Lord, Your goodness is real, so real we can taste it in every bite of food, in every daily portion of pleasure and provision. We truly lack no good thing under Your gracious hand. Lord, let us see this clearly. Teach me the contentment of knowing that You have given every good and perfect gift, everything needed for life and godliness. You are too good and too wise and too powerful to leave Your children lacking anything we truly need, any truly good thing. Father, it is so clear that the path of the life is found in following after You. Keep my tongue from evil - from boasting, from lying, from flattery, from foolish talk. Turn my feet away from evil to good. Make me a peacemaker and let me seek the peace that You would have me pursue. Give me the grace to forgive as I have been forgiven and to reconcile as I have been reconciled. Oh Lord, how wonderful it is to know that Your eyes are always on Your children and that Your ears always hear us when we cry to You in faith, You love us. You hear us, You deliver us. You comfort us and strengthen us when we need You most. Lord, there are so many in the world today who hate the righteous, from ISIS and other Islamo-fascist terrorists to God-haters here in America intent on silencing Your people and forcing us to abandon Your truth. Redeem us and keep us. Let us not be led astray or intimidated into silence, and let us not repay anyone evil for evil. May we always trust in You and obey Your command to love our enemies. For You are our glorious Lord and we are in Your hands.